Ready to use, pre-mixed KD Gold is made with water that has been reconstituted with reverse osmosis using Dr. Emoto’s wonderful method. Refill with concentrate (see below). Save $$ – Don’t pay to ship water. Each bottle of concentrate dilutes to 3-5 times its size (depending on desired use and water type). Try out some of the most popular uses for KD Gold in a Ready to Use premixed format, conveniently bottled in 16 oz sprayers. The spray bottles alone are worth $15! Then refill next time with environmentally conscious concentrate. 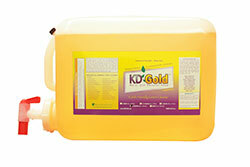 KD Gold also manufactures industrial formulas for janitorial and agricultural use. Visit KD Gold to inquire about obtaining drums or palettes of industrial use formulas. Tell them BEST DARN SOAP sent you! Click here to order a handy refillable 2 oz. sample with premixed hand soap to carry with you (avoiding those nasty restroom hand soaps).